Victor Juhasz was born February 19, 1954 in Newark, New Jersey. He exhibited a marked interest in drawing early in life. Even so, it was not until high school at the prodding of his art teacher did he abandon a fantasy of being a cross-country truck driver and pursue a vocation in art. A graduate of the Parsons School of Design, Victor began illustrating in 1974, for THE NEW YORK TIMES, while still a student and has been working non-stop ever since. His humorous caricatures and illustrations have been commissioned by many of the major magazines, newspapers, advertising agencies, and book publishers, both national and international, and his client list includes TIME, NEWSWEEK, THE NEW YORKER, SPORTS ILLUSTRATED, FORTUNE, ROLLING STONE, THE WALL STREET JOURNAL, THE NEW YORK TIMES, ESQUIRE, GQ, THE WASHINGTON POST, OXFORD UNIVERSITY PRESS, ST. MARTIN’S PRESS, GROVE/ATLANTIC, SIERRA, OPERA NEWS, THE NATION, BOZELL, DELLAFEMINA, FOOTE CONE BELDING, OGILVY & MATHER WORLDWIDE, PROCTER & GAMBLE, THE UNITED STATE AIR FORCE ART PROGRAM, and MORTON SWINSKY PRODUCTIONS. Victor’s work appears monthly in GOLF MAGAZINE as part of David Feherty’s ‘Sidespin’ column for 10 years now and those drawings have been included in two volumes of Feherty’s collected writings published by RUGGEDLAND PRESS. His illustrations also appear regularly on the front page of THE NEW YORK OBSERVER. Victor also illustrates children’s books. His collaborations with SLEEPING BEAR PRESS over the past several years have produced the critically acclaimed D IS FOR DEMOCRACY, EVERYONE COUNTS, R IS FOR RHYME, H IS FOR HONOR- A MILITARY FAMILY ALPHABET and the soon to be released, Z IS FOR ZEUS. 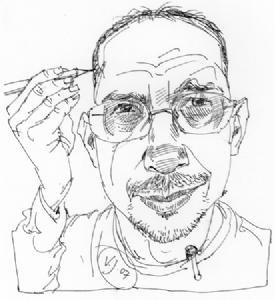 While caricature and humorous illustration remain his preferences, Victor’s love of drawing has allowed him to cross over to other aspects of the profession. He’s done courtroom drawings for ABC-TV, including the arraignment of the notorious Son of Sam, and, for the WASHINGTON POST, the trial of John Hinckley for the attempted assassination of President Ronald Reagan. As a member of the U.S. Air Force Art Program he has done reportorial work of the armed forces in training. He further addresses his more serious side (not often enough) with oil painting and watercolors. Victor serves on the Board of Directors of the Society of Illustrators, has appeared in numerous exhibitions, and has been the recipient of awards and citations for his work. His caricatures are owned by a number of his subjects, including David Boies, former Senators John Breaux and Tom Daschle, Tim Zagat, Joe Torre, Georgette Mosbacher, Peter Gallagher, Liev Schreiber, Ken Burns, David Toms, and George Lopez. He lives in Stephentown, NY, in the New York Berkshires, with his wife, Terri, a life coach, psychotherapist, and teacher. They are the very proud parents of three grown sons, Max, Alex, and Ben, and, recently, via Max, very proud and happy grandparents. A sampling of Victor’s work can be seen at WWW.VICTORJUHASZ.COM. Merry Christmas, & welcome to JacketFlap.